Paris is one of the most fascinating, most exciting and most wonderful city trip destinations in Europe. I can assure you, no matter how many times you return to Paris, there is always something new to discover. It is perfect as a weekend getaway or a sneaky mid-week trip with your loved one – always surprising, always romantic. If you are a first-timer to Paris, you may want to start with the obvious attractions first. With 2-day itinerary, Paris will be easy to conquer. We show you this beautiful city in the best way possible, introducing you to some of the most famous Paris landmarks, recommending restaurants and giving you some very useful insider info. At the end of this post we share some essential tips and advice for your first trip to Paris, so make sure you read all the way to the bottom! This map shows the different stations of the self-guided walking tour. The first day will focus on the left bank of the Seine, home of students, migrants and artists. The second day will introduce you to palaces, gardens and high-end shopping. Our first day of this 2 day itinerary will take you to the Seine islands and then to the atmospheric Left Bank quarters. Highlight of the day will be a visit to the unforgettable Eiffel Tower. 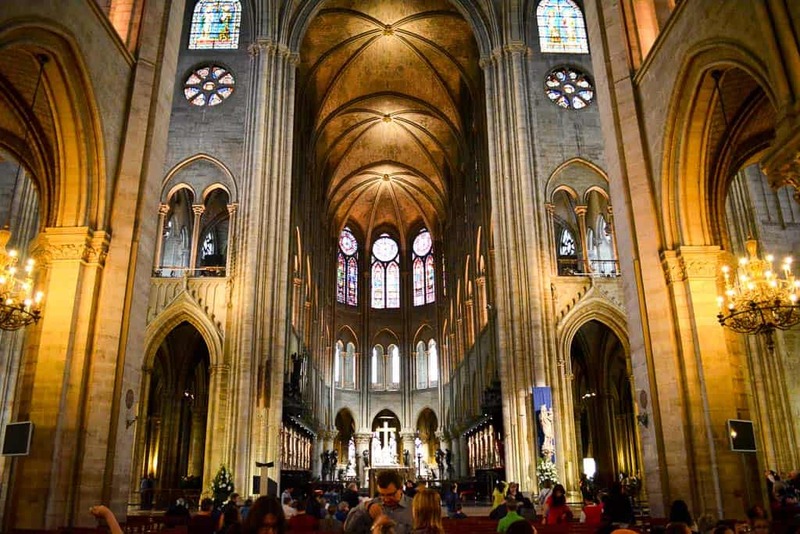 Start your day with a visit to Notre Dame de Paris. With its flying buttresses it is one of the best known churches in Paris, and rightly so. The over-dimensional stained glass windows are just marvellous. We go there first thing in the morning to beat the crowds. If you also want to climb the towers to enjoy the views and see the gargoyles up close, download the free JeFile app and select your preferred time slot. Buy your ticket at the kiosk just before the allocated time. Read our review of Notre Dame here. Notre Dame de Paris is of course the home of the famous Hunchback. But there is a lot more to discover in this marvellous church. From Notre Dame church it is a quick walk across the bridge to one of our most favourite parts of Paris, Île Saint Louis. Take a stroll to Rue Saint-Louis and treat yourself to some of the best ice-cream in Paris, at Berthillion. Then, check out the shop windows of the quaint boutiques, galleries and jewellery shops. Watch the impromptu street performers and maybe join the people in the cafés for a café-au-lait or a relaxed lunch, for example at Aux Anysetiers Du Roy (61 Rue Saint-Louis en L’Ile). Head across the bridge to the left bank of the Seine. This is the Latin Quarter, where traditionally students of the nearby Sorbonne university would live. The winding streets are narrow and full of life: bistros, crêperies and good restaurants vie for your attention. It’s a colourful commercial area, an ethnic melting pot where you will hear all sorts of languages spoken. Feel free to explore but if you don’t have a lot of time, stick to the area close to Rue Mouffetard. 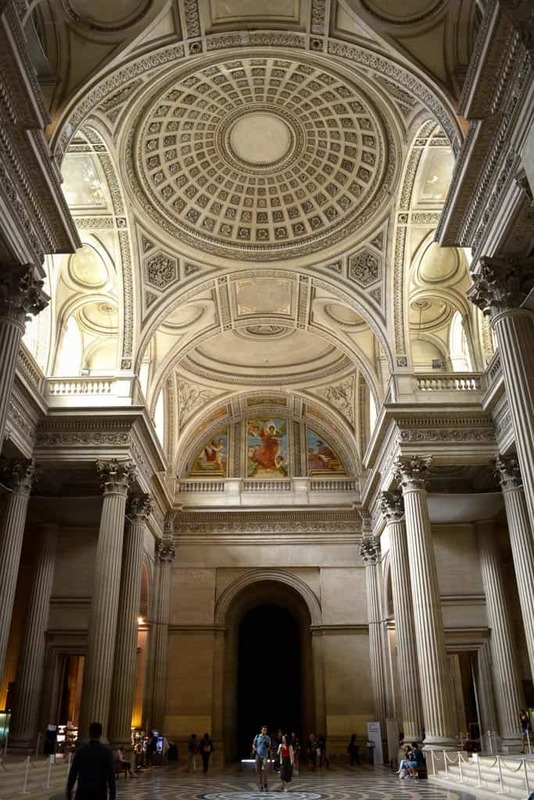 The Panthéon is not just a pretty building. It is also the last resting place for many distinguished French citizens. You will be surprised how many you already know. Right in the middle of the Latin Quarter, check out the Panthéon. Named so after an ancient building of the same name in Rome which has an equally impressive dome. Originally a church, it is today the resting place of the most distinguished French people. You think you don’t know any? Think again. Maybe the likes of Marie Curie, Alexandre Dumas or Victor Hugo will ring a bell. You will also see Foucault’s pendulum here. At an entry of 9 EUR it’s not the cheapest place to visit, but it’s a great way to learn more about French history and culture. Read our review of the Panthéon here. Time to relax! Luxemburg Gardens is just around the corner. A beautiful park, where children like to go on the historic merry-go-rounds, ride a pony or play with the wooden boats in the ponds. Grab one of the many chairs and rest your feet in the shade of one of the trees. Some interesting sights to see here too: The model of the Statue of Liberty and the Medici fountain are both worth a look. 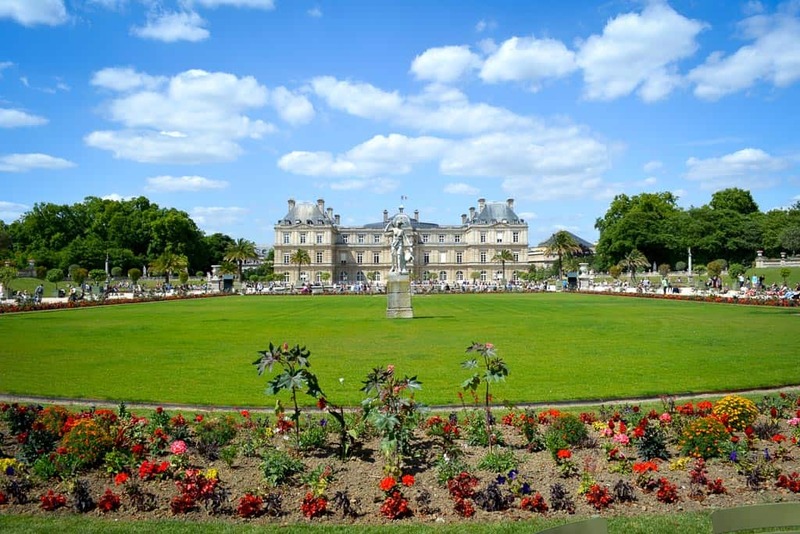 Read our review of the Luxemburg Gardens here. The Luxemburg Gardens with their flower beds are so pretty in summer. But did you also know that there is a predecessor to the Statue of Liberty hidden here? Walk a little bit further, to the area known as Saint Germain des Prés. It’s another one of our favourites, where you can nibble on macarons as you go window shopping or sip a coffee in one of the many cafés. This is where Hemingway might have sat, or maybe one of the other countless poets who called the quarter their home. Hungry? Try a salad, sandwich or soup from the menu of famous Café de Flore (172 Boulevard Saint-Germain). As the day nears the finish line, you have one last attraction to cover for the day, and it’s a big one too. The Eiffel Tower, of course, needs to be featured on any 2 day itinerary of Paris. Now, beware of the crowds though. You need to come prepared – buy your tickets online many weeks in advance! Tickets come in two stages – to access the first and second floors, and then to access the top floor (summit). The cheapest, quickest and easiest option to get a ticket is by buying stairs tickets to gain access to at least the first two floors. These stairs-only tickets can only be bought on the spot and gives you instant access. But, you have to walk upstairs, of course. We share more info about the Eiffel Tower here. Get your tickets to the Eiffel Tower via the official website. If all sold out, try GetYourGuide instead (Affiliate link). As the sun sets and you walk back to your hotel, turn around one last time to see the Eiffel Tower sparkle for five minutes every hour on the hour. What a great way to end the day! 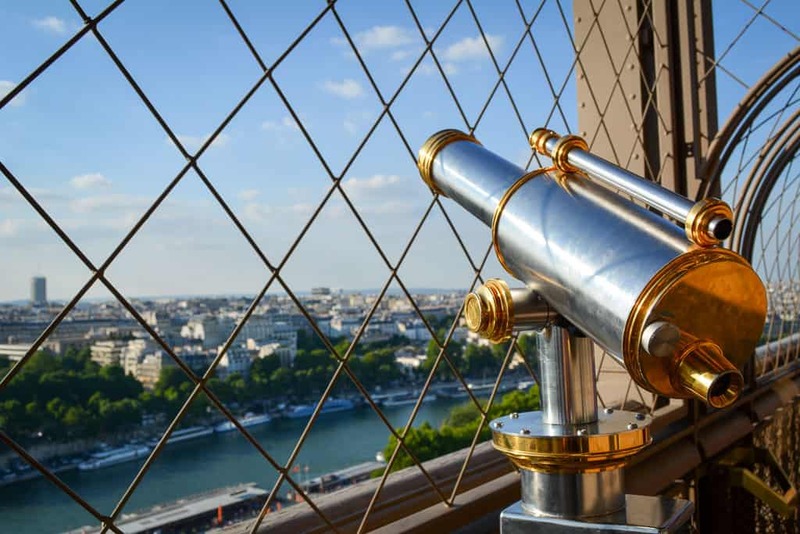 You cannot miss the wonderful views from the Eiffel Tower. If you choose the cheaper option of stairs tickets, you also get some amazing insights into the structure of the tower. I hope your feet are not too sore after your first day in Paris. Even though things are pretty close to each other, you always end up walking just a little bit too much. But it’s the way of getting to know the city, without having to worry about traffic and taking your time to notice all these little details around you. Well, are you ready for day 2? Here you go! Start your day with the Louvre Museum which opens its doors at 9am (it is closed on Tuesdays!). Purchase your tickets online to avoid the queues. Here is the link to the official website. 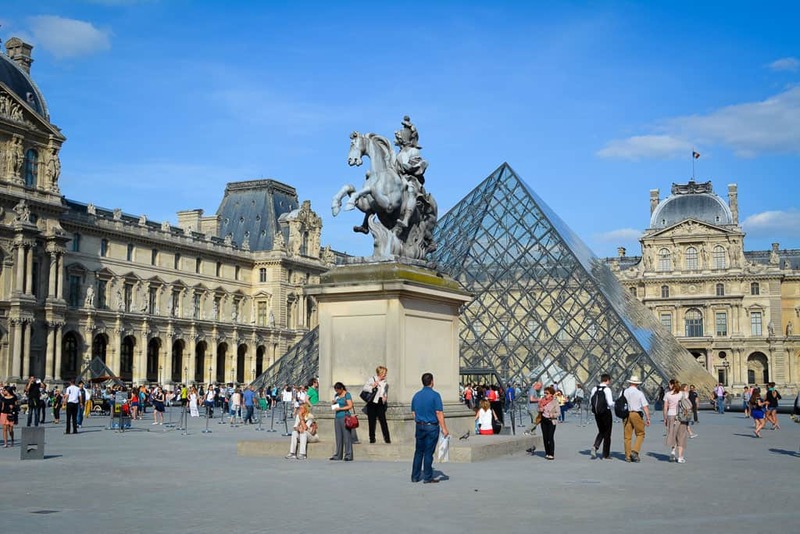 Alternatively, join a guided Louvre tour, which you can book here. (Affiliate Link) It’s the perfect place for art lovers. Of course, there is not just the Mona Lisa to see here, but also the Winged Victory of Samothrace, Venus de Milo and lots of ancient artefacts and sculptures. 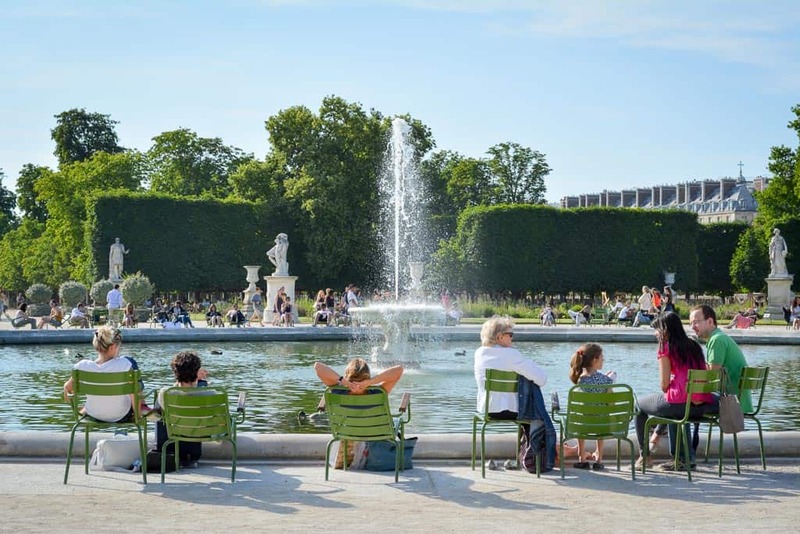 Once art fatigue kicks in, go for a walk in the nearby Jardin des Tuileries, a long beautiful park that stretches all the way to the Place de la Concorde. Chill out in the heart of Paris but don’t get tricked by the con artists. Grab a coffee to go from one of the cafés and watch the ducks and people as you walk. You may also want to go on the ferris wheel for some gorgeous views from above! On a warm summer’s day this is Paris at its finest. The water in the fountain in the Touleries Gardens looks so refreshing! A great place to spend a lazy Parisian afternoon in summer. Place de la Concorde used to be the place of executions, in particular during the French Revolution. Hard to picture now as the general daily Paris traffic chaos unfolds in front of your eyes. Check out the 3,300 year old Egyptian Obelisk, hauled here all the way from Luxor in 1836. It is flanked on the north and south by two huge elaborate fountains. Walk on from here to the Champs Élysées, Paris’s premier boulevard. Indulge in some window shopping and stay on the lookout for famous high-end fashion stores. Find a nice restaurant for lunch, for example Flora Danica (142 Champs Élysées). All the major brands are here: Disney and Lacoste, Zara and McDonalds, and Louis Vuitton. Just keep on walking, don’t overspend (I know, it’s hard! ), until you reach the Arc de Triomphe at the very end. The Arc de Triomphe was built for Napoleon Bonaparte, to commemorate his great victories in the name of France. If you like, use the underground tunnel to go inside to see the exhibition. It explains the history and meaning of the monument. Can you imagine that a biplane was flown through the Arc during the celebrations following the World War I? The terrace offers great views down the Champs Élysées, and the sight of the 12 avenues radiating from here cannot be missed. Another highlight is the Tomb of the Unknown Soldier. The cheapest and easiest way to get from the Arc de Triomphe to our next stop, Sacre-Coeur de Paris, is by metro. Purchase tickets from the machine in the station and take the number 2 to Anvers. From the metro station, head north toward Montmartre. You will have to climb a few steps but the effort is worth it. If the Funiculare is not busy, you may want to go on a ride instead. The cost of the Funiculare is the same as for a metro ticket. Once you are on the Butte Montmartre, the highest point in Paris, turn around to see the lovely views from the terrace. Then visit the beautiful church Sacre-Coeur Basilica. The church is only about a hundred years old, yet it is just about as beautiful as Notre Dame! 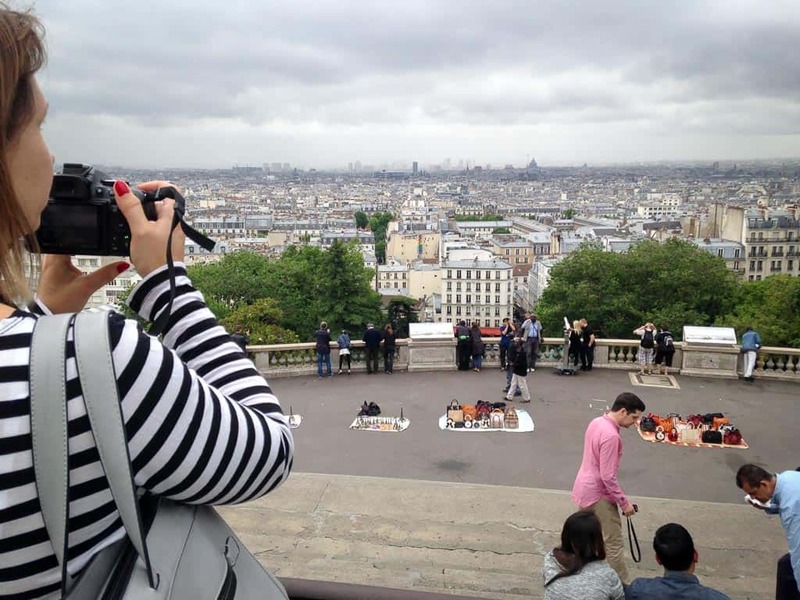 2 Day Itinerary Paris: The Butte Montmartre is the highest point in Paris. A good reason to visit as you get to enjoy some great views from here. From the church, head west and dive into the quarter named Montmartre. This artist quarter is the place where many famous people used to live and work, including Picasso, Monet and Van Gogh. Even though it is today quite touristy, with its cobblestone streets and little cottages it still has this very distinct old village feel that I am sure you will fall in love with. Lots of local artists sit in the corners waiting for customers. A great opportunity to take home a portrait of you or your kids. The Dalí Museum Espace Dalí is good fun, in particular for children. As you slowly find your way down the mountain again and back towards the centre, pick a restaurant for dinner, for example Les Apotres de Pigalle (2 rue Germain Pilon). I hope you enjoyed this 2 day itinerary for Paris and that it will serve you well for your first visit to the city. If you need more help with planning your trip to Paris, check out the Lonely Planet website. 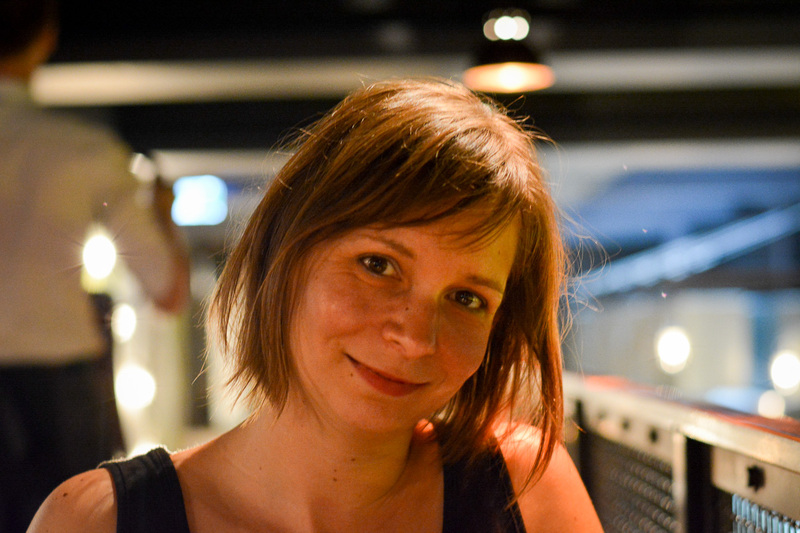 If it’s your first time in Paris you will probably have quite a few questions. In the following, I will explain a bit more abou the Paris Pass, how to get around and where to stay. The Paris Pass gives you unlimited access to some of the best known Paris attractions. If you are planning on visiting a lot of attractions and museums in Paris, this could mean tons of savings. You will also have free use of the public transport system. Unfortunately, even though more than 60 attractions are featured, the Paris Pass does not include access to the Eiffel Tower. As with any city pass, I strongly recommend you compare the offer with your planned itinerary. Add up all individual ticket costs and check the fare for moving between places. This will give you a rough estimate as to whether you will indeed save by buying a city pass. From my experience, most city passes will offer far more than you can possibly see within the given timeframe, meaning that you end up spending too much money or feeling too much under pressure to make the most of the money already spent. On the upside, Paris Pass holders very often make use of the privilege of skipping the line. Click here for the official Paris Pass website. Paris is well connected thanks to an extensive public transport system which includes busses, the metro and suburb trains (RER). The network is divided into zones made up of concentric circles that cover the regions 1-3. The fare is calculated depending on which zones you want to travel in. You can easily buy tickets as you go at kiosks and ticket machines near the stations. The machines speak your language and will accept cards. If you are planning on using the metro a lot, buy a stack of 10 tickets which will come with a nice discount. If you use the Paris Pass, transport will be included for the length of your stay – make the calculations to see if you really need it! Paris is fun all year around, but the summer months are obviously the best choice as you will have more of a good weather guarantee. Weekends and during the European summer holidays from June to September things can get very busy, so proper planning is a must to avoid long waiting times and booked out events. In winter, Christmas lights and decorated shops add another flavour to the already very pretty city. Make sure you wear comfortable shoes and take umbrella and coat where necessary! Countless thugs will try to scam you in Paris, in particular around the most famous tourist destinations like the Eiffel Tower, near the Centre Pompidou or in front of the Sacre-Coeur Basilica. Do not talk to these suspicious looking folks – they will not give you any presents but want to scam you in some way of the other. Also, beware of pick-pockets around famous attractions. Keep your money close to your body, preferable behind a zipper that is facing your body. Keep lose change for snacks, beggers, buskers in your pocket so you don’t have to reach for your wallet each time. There is a great choice of hotels and AirBnBs in Paris, so finding a good place to stay at a reasonable rate is not a big issue. It’s best if you stay close to one of the metro stations – in particular in the evening you will be glad to have quick access to your hotel room as your feet will be pretty sore after a long day of walking. Hotel 34B: Located just 1.5 km from the Louvre Museum, this small hotel is just in the middle of everything. It gets raving reviews, probably also because there is a daily selection of free snacks as well as a yummy breakfast buffet. Nearest metro station is Grands Boulevards Metro Station. Free Wifi in all areas. Perfect for couples. – Click here for more info and to check rates (Affiliate Link).